According to conversion rate, which posts make more positive influence on the sales? Which posts are more appealing to the new customers, and which are more appealing to returning ones? What social network is our most productive source of traffic? A UTM tag is a tracking module created by Urchin Software. The company is now owned by Google and develops Google Analytics. The name UTM is actually short for Urchin Tracking Module. utm_source is a variable you need to identify the source of incoming traffic. With social traffic, your source would be the name of the social network. If it’s a newsletter, the source would be the type of that newsletter (i.e. Blog newsletter, Product newsletter). Note that for your analytics suite supporting UTMs facebook and facebook.com are two different sources. To receive accurate reports, use the same spelling of social network names at all times. utm_medium describes the way the link is delivered to the user. If the medium is social, the link was originally posted to a social network. For a newsletter, the medium would be email. For paid ads, it would be cpc. utm_campaign is a name or a number you would give to a certain campaign your post or your letter promotes. If it’s a blog post you published to socials, an appropriate campaign name would be the article title. If it’s a newsletter — number it or write a month if it’s a monthly one. UTM variables help you track and analyze your web pages’ traffic. When a marketing analyst understands how the audience engages with the content and what they like or ignore, they can adjust the content plan accordingly. Always shorten the links you mark up with UTMs. You can also benefit from shortening your links because the link shorteners can count clicks for you! Use bit.ly, goo.gl, or Amplifr’s autoshortener. Use UTMs for all your traffic sources. Use them on social media, in paid ads, in your blog, and newsletter. Check out all the links to Amplifr in this article. All marked up! Use services that add UTMs to your links automatically to save time. Writing UTMs manually and getting used to it may take you some time. 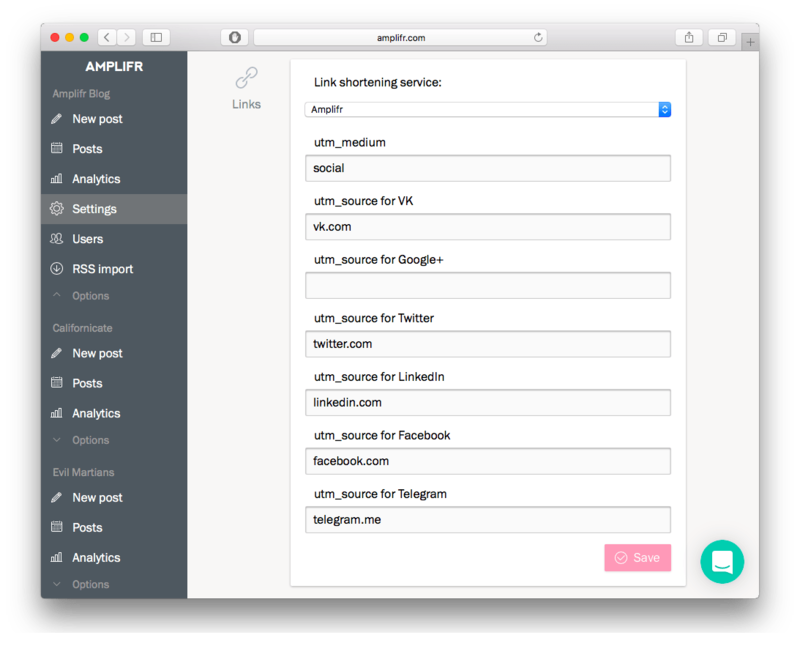 Amplifr can adds UTMs to all the links you post automatically—and shorten them too. We also made a printable educational poster about UTMs. With unicorns. Download it, print out and put it on a wall next to your favorite marketing analyst’s workplace, so they don’t ever forget to write the UTMs ever again.